Just a quick one today (then you can get back to your 4th of July preparations – we hope to be barbecuing, if it doesn’t rain too much). It may be only a sandwich, but it’s a sandwich worth talking about, and we’ve had it for lunch twice this week ’cause it was so good. We had leftover grilled lamb from earlier in the week, leftover piquillo peppers from a salad we had made, and pesto made from the last of the garlic scapes. 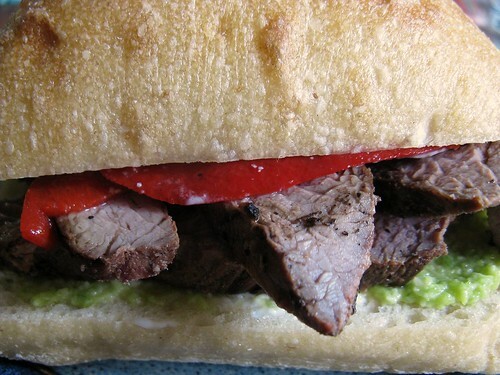 I sliced the lamb nice and thin, and piled it and the peppers on a fresh soft ciabatta roll with some mayonnaise and pesto, and it became an amazing, savory, garlicky lunch. I can’t think of a thing that would have improved it, except maybe a salad of baby greens and a glass of rosé. Mmmm.